Congratulations to "Marsha", the winner of Dana's giveaway. Thank you to all who participated! My birthday is November 24th and it often falls on Thanksgiving day. My mother loves telling the story of my birth. It’s the only part of her pregnancy she remembers. At four months pregnant, she and my father were in a motorcycle crash that nearly killed them both. In a lapse of judgment, my father leaned left when he should’ve leaned right, sending the cycle and both passengers off the road and over a steep hillside. My father broke his wrists and collarbone. My mother landed on her head, cracking her helmet and breaking her neck in two places. Fortunately they were riding with a group of friends, including a nurse. Later my mother was told, had she landed any other way, her baby would’ve died and the fall would have likely killed her as well. She was in a body cast for the next several months with a hole for her growing tummy. This cast included a halo that bolted to her forehead. I wish I had a picture to share, but I’ve only ever seen one picture of her while pregnant with me, and that belonged to a family friend. I don’t have a copy. Due to the accident, she doesn’t remember her pregnancy, but she remembers the day I was born. Because of the accident, she was seeing an obstetric specialist in a hospital about 30 miles from our house. She often complains (with a smile) about how I ruined her Thanksgiving dinner because she was so uncomfortable and feeling poorly all night. In the wee hours of the morning after Thanksgiving, she felt her first contraction. In a panic (this wasn’t her first rodeo, I’m the youngest of four) she dragged my father out of bed to drive her 30 miles to this hospital. And here is the part of the story she loves retelling. My father dropped her off in the emergency room, and then went to park the car. When he returned, she’d already given birth. She was in labor for exactly 19 minutes from start to finish. I was born at 5:01 in the morning . . . and to this day, my mother calls every year on my birthday at 5:01 in the morning to say happy birthday. Sarah’s eyes scanned the grounds again before turning toward the parking lot. She kept her pace normal. She wouldn’t let old fear push her to run to her car like a coward. She wasn’t in the city anymore. This neighborhood was safe, quiet, and she needed to just breathe through it and move ahead. Sarah started across, but stopped when a tingling sensation attacked her scalp. She waited and listened, her pulse a little quicker than a few minutes ago. That’s when she heard running footsteps. She looked up and met his eyes, a sick smile spread across his face. Fear dripped down her spine like a drop of cold water, and she knew she was in trouble. 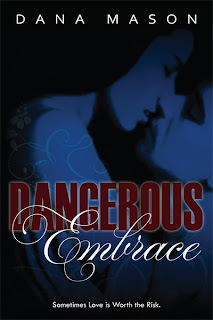 Dangerous Embrace is Dana’s debut novel. It’s set in Santa Rosa, a city in the Sonoma Valley, California. You can find it on Amazon, or Barnes and Noble. To jumpstart your Christmas shopping, Dana is giving away a $10.00 Amazon gift card to one lucky commenter. Tell us about your Black Friday rituals. Do you get up early and venture out into the cold for all the deals? Do you spent the day curled up with a laptop searching for the best online specials? Gorge on leftover turkey and stuffing? Spend the day in your pajamas reading? Giveaway ends 11:59pm EST Nov. 24th. Please supply your email in the post. You may use spaces or full text for security. (ex. jsmith at gmail dot com) If you do not wish to supply your email, or have trouble posting, please email maureen@justromanticsuspense.com with a subject title of JRS GIVEAWAY to be entered in the current giveaway. I like your answer. Curling up with a good book sounds like a great idea. I'm not one for crowds, especially frantic shoppers. Enjoy your relaxing day. Usually, I use the Thanksgiving break to travel to exotic places since I'm not American and have no family Stateside. But if I am in the US, I scope out all the Black Friday deals ahead of time to see if there's anything I want to queue up for, but mostly I shop online and spend the day hanging 'round at home reading. I did get up at 3:00 EST this morning to check out the Apple sale, though. And, sadly, I'll be going into lab to do experiments instead of lounging lazily around. Traveling to exotic places sounds like a great way to spend the weekend. :) I wouldn't mind leaving the house for that. Sorry you don't get to relax today, but have fun with your experiments. Over here in the UK we don't celebrate Thanksgiving and it sounds like we are soooo missing out! I'm envious of these feasts and the pumpkin pies! The only thing we get are the Amazon deals! What's not to love about Amazon deals? Loved the birth story, Dana! I suggest you take full advantage of the Amazon deals, especially since you didn't get any pie. Pumpkin pie is definitely one of my favorite things about Thanksgiving. Thanks for stopping by Mandy, hope you're enjoying your Friday. I used to go Black Friday shopping. I don't do it anymore. I got pushed around too much. lol. There was one year I was trying to get a cabbage patch doll and I got stuck where I was cause of the people behind me and to get them out of my way I had to give them the dolls. Later I found a hat in my cart that wasn't mine and I didn't get it. lol Someone had threw it in my cart. That's crazy! Black Friday is survival of the fittest and I'm not worthy of it. :) I'd rather pay a little bit more and shop on my computer. Thanks for checking out my post. This is the hottest story. I love your mom calls you on your birth minute. LOL Hope you get to use this in a story. She calls faithfully every year. :) I'm pretty sure she does it to all four of us, but my bother and sisters have normal birth times. Thanks for visiting, Rita. Hi Dana,I remember the accident well.wht i mean to say,i didnt see the accident but remember her in the cast.You are kucky to be here.Thanksgiving was good.Turkey and all the trimmings plus family to share with. Thank you. I'm glad you enjoyed Thanksgiving. I love having an entire day to spend with my family and friends. Our lives are so busy these days, it's a nice reminder of what's really important. Happy Birthday, Dana. I don't usually venture out on Black Friday. I just look for online deals. Thank you, Jane. I tried doing Black Friday shopping a couple of years ago, but quickly realized that my time was better spent staying close to home. It seems on Black Friday, shopping becomes more of a sport and I've never been much of an athlete. What a great story, you are a miracle baby and a19 minute labor, I am so jealous, I was in labor for 27 hours! Your book sounds excellent,I can't wait to read it! I only shop from home the crowds are too much for me:) But I have found some excellent deals and amazon has lots of great books marked down today:) I ate way to much yesterday getting ready to go have another one with my husbands side tonight and one more Sunday! I will probably have to work out next week:) Happy Holidays Everyone! Thanks, Allyson. 27 hours?!?! Wow! I hope you check out Dangerous Embrace. I've snatched a few of the excellent books deals on Amazon today too. I have another Thanksgiving tomorrow with my husband's family. We've decided to take a break from turkey and eat Mexican food. Happy Thanksgiving! We stopped at a couple of stores and also bought some things online but no standing in line for us. The news showed people camping out three days ago in front of some stores. I can't imagine anything on the planet I need or want bad enough to wait in line for several days. Happy Thanksgiving, Maureen. I just love that your Mom calls you at your birth time to wish you a Happy Birthday; I think that's pretty special. Up until a couple of years ago, I had to work Black Friday, which was really okay with me because I hate shopping. I guess my only ritual would be to avoid stores altogether! I always have Black Friday off from work, but that still doesn't make me want to venture out into the crowds. I like your ritual. Oh my goodness! What a story... glad everything turned out well. Happy Happy Birthday! My Black Fridays are spent home... my sisters and mother go battle all of the craziness. I wait until later when things calm down to go out. Yes, everyone survived just fine. Thanks for the birthday wishes. I think later on Black Friday must be pretty mellow considering all the sales now seem to start the night before. The die hard shoppers need to sleep at some point. Happy Birthday! No Black Friday shopping. Thanks for the birthday wishes. I hope you enjoyed your day no matter how she spent it. Good luck with the giveaway. Yes, my Black Friday ritual is getting up early to shop. Now that Black Friday starts after Thanksgiving dinner, my Black Friday ritual is being no longer a ritual. I need a purpose for the Thanksgiving weekend. Happy Thanksgiving, Kai. Thanks for the birthday wishes. I hope you found many great deals today while your were out shopping. Wow! what a lucky family. Your book sounds absolutely awesome!! I don't go shopping at all on black friday, no way am I fighting the crowds. Hung out and scrapbooked with a friend. Happy birthday. Thank you, Martha. I hope you check out Dangerous Embrace. Scrapbooking with friends sounds like a great way to spend a day off. I hope it was fun and productive. Thank you for sharing your story. It's just wonderful. I love happy outcomes. As for the crazy shopping. No thank you!! Thanks for stopping by and reading my story. I hope you enjoyed your day, I'm not much for Black Friday shopping either. Happy Birthday, Dana! Thanks for sharing your story. Black Fridays means staying at home enjoying the company of relatives and friends. It is nice having another day off to enjoy with our families. Sometimes we get too caught up in the presentation of our Thanksgiving dinners to really enjoy each other's company, having an extra day with no responsibilities is a blessing. Thank you, Ann. My mother is thankful about the short labor too. We also have huge boxing day sales, but they're not quite as popular as Black Friday. Thanks for stopping by. Thank you! I tried the black Friday shopping twice and found that the deal weren't that great unless you were willing to fight for them. It wasn't worth it. Online shopping is much more my style. I hope you had a wonderful Thanksgiving! Loved Dangerous Embrace and I am eagerly waiting for your next novel! AS for black Friday, I shop online! Thanks for the giveaway! Thank you! I'm so happy you loved Dangerous Embrace. Precious Embrace should be out by next summer. What a birth story. I'm so glad you both survived. I can't imagine being in such hellish discomfort for so long. Your poor mom! Thank you! And wow! When I need to replace my laptop, I'm taking you shopping with me. :) I don't know why someone would put themselves through that and then complain about it the entire time. Glad you got the laptop. It really is survival of the fittest. Thank you! I love that you increase the pain every year. I guess as we get older and our memories start fading, we need to exaggerate a little to keep it interesting. Hey, Dana. Great book excerpt. Got my pulse pounding. May be there is some crazy reason for me to be here. :) I suppose if my kid discovers the cure for cancer, my mom can say it was all worth it. You know, after all the stuff I've said about Black Friday being a crazy shopping day, I must say, in my hometown the shopping is crazy from Thanksgiving to New Year's. I void to mall at all cost this time of year. Most of my shopping is done online. Thanks for stopping by. I hope you'll check out Dangerous Embrace. Ha! Oh yes, I've been called everything from Turkey Baby to Kid Pumpkin. I've also had my family stick birthday candles in many different places, pumpkin pie, turkey, yams, you name it. :) Tell your husband happy birthday. Hi there cuz, and Happy, Happy Birthday! I too remember when you mom was in a full body cast but this is the first I've heard about the whole story. I didn't realize she was pregnant with you, so that is also a miracle in itself. I love that she calls you every year on your birth time. I try to do the same with my daughter also. I'm planning to buy your book this next week and can't wait to read it. This will will the first romance I've read in many years. And Precious Embrace sounds just as intriguing. Congrats on all the hard (fun) work put into these two. Keep them coming...you make me proud.